Dean Poulsen earned his MA from Wesleyan in World Music. 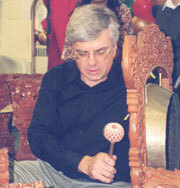 He studied Balinese and Javanese gamelan in Wesleyan and at the Gamelan-Academi Seni Kawaritan in Bali, Indonesia. He studied piano with Lawrence Ferreira; harpsichord with Gavin Black, Chinese music (GuCheng) with Hao An; improvisation with Anthony Braxton; electronic music/composition with Ron Kuivilla; and ancient Japanese music (Gagaku) with M. Togi, formerly Music Minister of Japan. He was choir director of the Westminster First Presbyterian Church. He is currently Director of Music and organist at Faith Lutheran Church; Director of Music Technology and piano teacher at Reilly Middle School in Elizabeth; and member of the faculty of Westminster Conservatory of Rider University in Princeton, teaching the art of improvisation, and Balinese gamelan. He has done several recordings with the New Jersey Percussion Ensemble; Percussion Symphony with Charles Wuorinen (Nonesuch/Warner); Ringing Changes with Charles Wuorinen (Bridge Records); harpsichord on Hargateeni (Middle Eastern Music) (Lion Records); and he himself produced Music Sculptures 1-7, consisting of electronic music. He plays keyboard with New Image Trio, and free lance piano. He has performed in Taiwan, Indonesia, New York and New Jersey and studied at the Stockhausen Composition Summer Courses, 1999.